Ingredients, highlighted allergens, Nutrition, barcode, expiry date, batch number, cook instructions, storage instructions? KTEC GROUP has over 30 years' experience at providing labelling printers for food and drink. This is a guide to how you can print your own food and nutrition labels for flexibility and to reduce costs. We discuss the different methods possible....In each case, with a roll fed label printer, rolls of blank labels and simple to use software, it's possible to print exactly the number of labels needed for each product or package with no wastage. Printing labels as you need them means you can change the details in an instant and no risk of labels going out of date. The Epson ColorWorks printers along with blank label rolls and a choice of label software is ideal for today's needs whether you just need extra fine details printed in black and white or can use the power of full colour label printing. By combining a roll label printer with label design software its possible to automate many of the tasks needed to keep in line with food and drink labelling law and fashion whilst also adding the ability to merge in photos, logos and other variable data that will help you sell your products into new markets. We help our customer keep up to date with the food labelling law using software to help get products labelled correctly and efficiently. 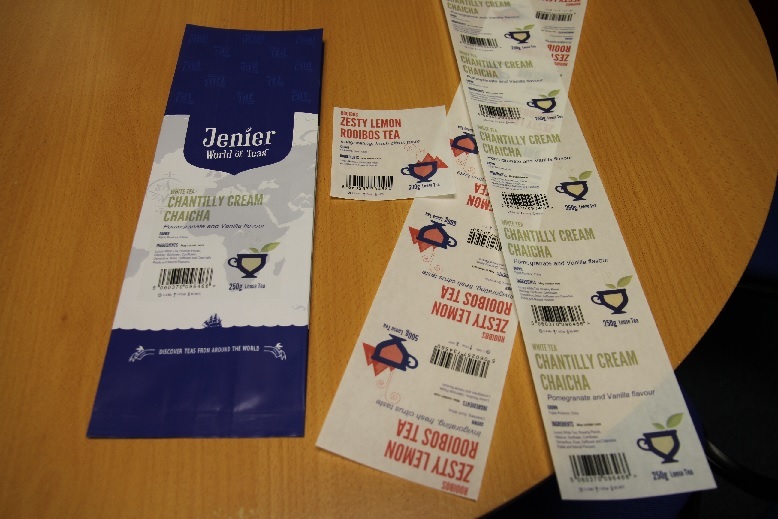 In previous times our customers have used single colour (usually black print) thermal transfer printers to overprint ingredient details onto part printed labels. This method has worked for years but customers have had to keep stock of pre-printed labels taking up space and not knowing how many of each type to order. The print quality of these thermal over printers limits the amount of detail you can print, it's due to the dots per inch (dpi) of the old printers being 200 or 300 dpi and also the ribbon transfer method. The UK Government now pressure supplies by law to add a lot more detail to the labels including full 'compound ingredients' detail, not just the ingredients but what makes up the ingredients meaning if we do not improve the labelling the labels can end up too large for the item trying to cram everything on! Also notice the Allergens are highlighted by making them bold, highlighting of allergens has been a legal requirement since 2014. With ink jet printers we can use all the modern typefaces (fonts) available on your computer and not limited by the old style fonts of older label printer types. Our ink jet label printers are selling fast for food and drink label printing as a result. Some customers have tried office type laser sheet label printers but find that the heat needed to melt the toner powder causes the adhesive of the labels to melt and the labels get easily jammed and can ruin the printer. Having to align and print several labels per A4 page is not efficient and labels are wasted when trying to print exact quantities for each product. With a roll fed ink jet printer it's possible to simply print one label image to get one label or enter a quantity and the exact number needed are printed at speed. The roll label printer automatically aligns the label image to each die-cut label on the roll. It's also possible to use a motorised roll winder to catch the labels and wind them to neat rolls ready for use in production by hand apply or by auto dispensing or auto application, to speed up getting the printed labels onto the products. We recommend the use of BarTender the world leading label design software we support. Many of our roll label printers are bundles with the Lite version a free copy. The Basic version is the first level of paid software that has powerful features useful for food labelling. This level has the ability to run the Word Processor facility so you can go in and edit the individual allergens appearing in the ingredients like Gluten and Soya and the like. The professional version is the second level of paid software that has powerful features useful for food labelling. This level has the ability to run the Word Processor facility so you can go in and edit the individual allergens appearing in the ingredients like Gluten and Soya and the like. But also has the ability to merge print variable data to each label from a product database or spreadsheet. The database/ spreadsheet need only contain a list of products, ingredients, nutrition values etc. using a product list its simple tpo add and delet and edit product in the list without having to design new labels. The data is merged at print time to a common label layout called a template so far less design work. The allergens can be listed once only and BarTender Professional (pro) has a 'macro' facility that will automatically search for an BOLD any occurrence of any listed allergen word on every label design you make. Customer use the power of printing from a product list to also be able to fast search product for printing by the day to day user just by selecting or keying in a part of the product name 'lemon driz' or entering a known product number '123' for example called Product Look Up (PLU). 5) Use BarTender Automation to merge print the product , nutrition, allergen, expiry date and provide powerful control of background colours and own brand logos. The Automation version is the third level of paid software that has powerful features useful for food labelling. This level has the ability to add layers to a label design so at print time its possible to also print merge different colour shaded background designs and logos as well as merging the variable data. 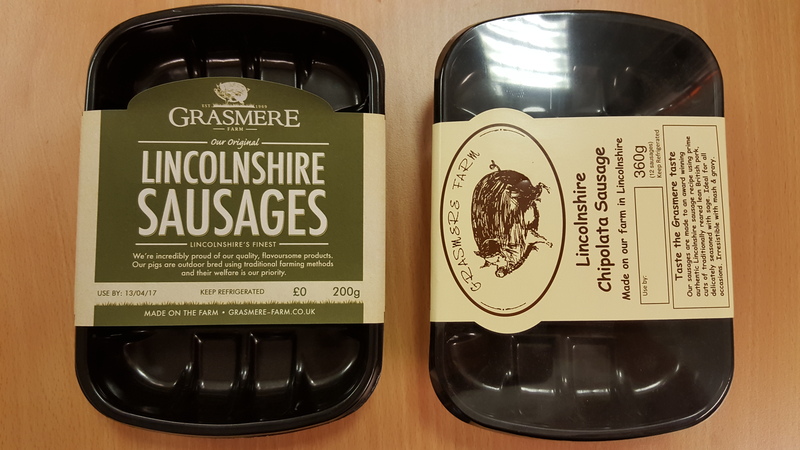 Label layers can be rotated in areas so in the above example the front area reads as normal but the sides are readable form the side and bottom on the pack after the labels is applied. The Automation version also allows multiple users for design and users for printing across a company network and can control multiple printers in different places in the office or factory. The software is purchased say to allow any number of PC users and so it unlocks to provide 3, 5, 10, 20 printers or more as needed and can enable each user to be a designer or a day to day label printer person who cant alter the designs, so adding good control over security. Allergens: The need to show and highlight allergens has been with us for a while. Our customers have made good use of BarTender that has a template label to help with this. The template label is linked to a list of popular allergens, Milk, Soya etc. You can edit the list of allergens to suit your own products. Then when you design a label and if it has any of the allergens listed they will be automatically be bolded, a requirement of the food labelling laws. 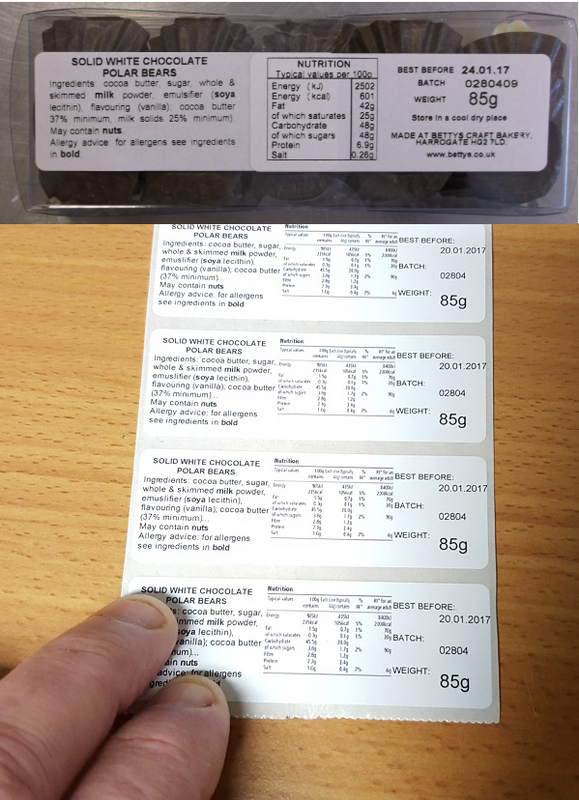 We also have a recipe labelling software called Food Management System (FMS) that can also highlight the allergens in colour, see the above photo of a sandwich label with the allergens highlighted in red and showing just how much information needs to be displayed these days. Some users will seek nutrition information from an on-line system then have to key this into their labelling program. We offer the Food Management System (FMS) that is a recipe based labelling system that can automate all these tasks for you and prints to a mono or full colour label printer. FMS requires that you simply enter each ingredient you use along with its particular nutrition detail from the supplers pack, then drag and drop ingredients into list to create a product, add a weight for each ingredient in that product and FMS pays back by automatically calculating the nutrition of the total meal and displaying it in a ready-made table that you can drag to a suitable place on your label design. Not only that FMS will list the compound ingredients, the full listing of all the ingredient components in the required weight order. Quantitative Ingredient Declarations (QUID): QUID is a % of the most significant ingredient compared to the whole meal. For example selling a Ham Salad Sandwich requires you display the % of Ham in the meal. FMS will automatically calculate this and display the QUID% on each meal pack. There is no harm is setting the system to show the % of other ingredients but you must at least display the % of the main ingredient whether it be Ham or Cheese or Egg or Beef etc. Expiry Date: BarTender and FMS can be set to automatically calculate and add the expiry date to each meal pack. For a short life product it will be set as example USE BY: 23 September 20xx meaning it must be consumed before that date. For say a frozen product it will have a longer life so or example BEST BEFORE: End of December 20xx is used. You will need to specify the shelf life of the product in days or months then the software will look at the manufacturing date from the clock on your computer and automatically print the correct expiry date on every product labelled. In summary BarTender can automate certain features of your labelling requirements. Watch the EPSON C7500G in use printing recipe labels. Own Brand Logos and Photos Create New Markets. Customers use our labelling system in many ways. One customer uses a two part label to separate the simple meal title information as a front of pack label from the more detailed ingredients and nutrition information on a label placed on a label at the back of the pack, but designs and prints both as a product pair. Another customer found exciting new markets by featuring their customer's own brands and even personalising products with photographs of their venues. A third customer uses colour to help identify product ranges by flavour and country of origin. Remembering each customer only needs a stock of low cost labels and the digital roll label printer to print the exact number of labels needed for each product each day. Clear Labels Add Variable Data to Printed Packages. Another customer uses our colour label printer to print variable product information onto clear labels that are then applied to low cost part printed pouches. Whatever your products a colour roll label printer, the most appropriate software package and our advice and support means a way to better labelling now and in the future.